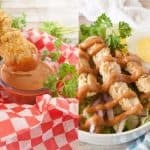 This Spicy BBQ Ranch dressing will knock your socks off! Use it as a dipping sauce or a salad dressing! Either way you’re in for something awesome! Mix all the ingredients together well and serve as a dipping sauce or as a salad dressing! Only use the Hidden Valley Ranch mix that you mix up yourself with milk and mayo for the ranch dressing in this recipe.